Two readers commented about avoiding the worst days on my post about the meaningless stats on missing the best days. The stock market had some bad days since then. I think some might be interested in reading about avoiding the worst days. First I want to emphasize that the whole point of my previous post was that it’s IMPOSSIBLE to miss the best 10 days in 10 years. The odds are 1 in 2.8 billion billion billion, which is like winning the Powerball jackpot with a single ticket purchase back to back to back. By the same calculation it’s equally IMPOSSIBLE to avoid the worst 10 days. But since they asked, I compiled some numbers for avoiding the worst 10 days in 10 years. So here you go, more meaningless stats. $1 invested for 10 years turned into $2.24 if left untouched. If the best 10 days had been missed (IMPOSSIBLE), it would grow to only $1.40, barely beating inflation. If the worst 10 days had been avoided (IMPOSSIBLE again), it would become $3.67, a huge jump. If both the best 10 days and the worst 10 days were taken out, they would cancel out each other — $1 would grow to $2.29, similar to the $2.24 number if left untouched. So don’t worry about missing the best days or try to avoid the worst days. All together the best 10 days were up 60%, and the worst 10 days were down 39%. You see the best days don’t necessarily fall in bull markets and the worst days don’t necessarily fall in bear markets. 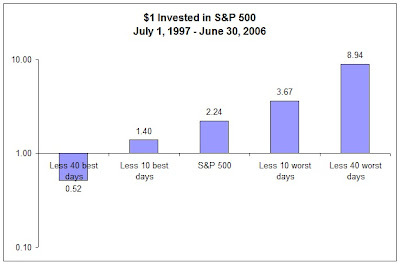 7 out the 10 best days happened in the bear market from 2000 and 2002, during which the S&P 500 index lost 38%. 4 out of 10 worst days happened in 1997 and 1998, when the S&P 500 gained 71%. The bottom line is that the stock market is volatile. Sometimes it goes up and down a lot. A good day on the stock market doesn’t necessarily mean good times are ahead. A bad day doesn’t necessarily mean good times are over. Ignore the noise. Scott – I fixed the summary table. Sorry I don’t have the detail calculation spreadsheet any more. Thanks for publishing the “Avoiding the Worst Days and Missing the Best Days.” I recently attended a Schwab presentation where the “best” graphics was shown. I understood that was meaningless (as you said) but wondered about the flip side … being out of the market on the worst days. Your article confirmed what I suspected … it’s all meaningless. However, neither suggests “buy and hold” is the one best strategy … that there are times to be out of the market. Trick is guessing correctly when to get out, then when to get back in. We managed to do this in 1987, 2001 and 2008, with good results.